Welcome to A Sampling Bee! 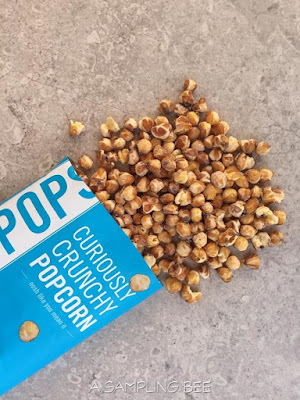 Today, I share with you HalfPops Curiously Crunchy Popcorn! What are HalfPops?? Half-popped kernels- a whole bag full! These little kernels are the perfect salted snack. They are healthy, low in sodium, low in sugar and low in calories. A snack that is crumb-free and indestructible. 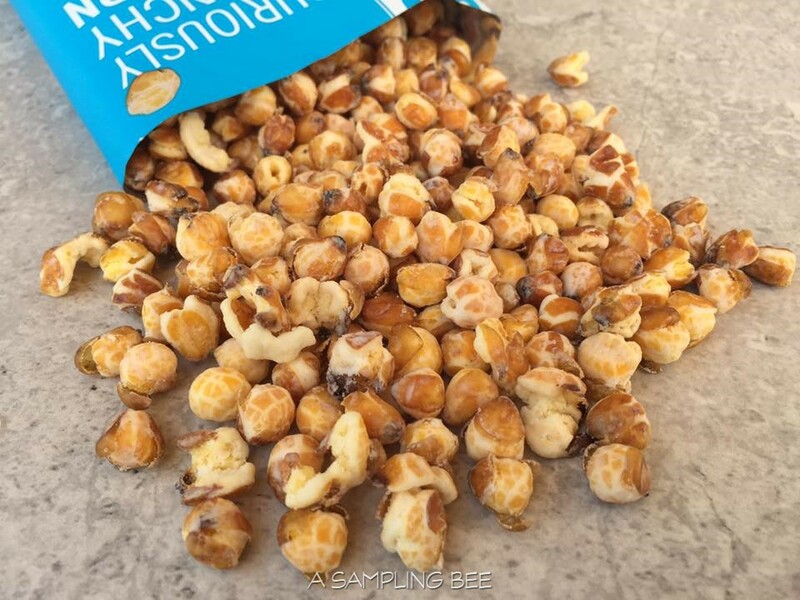 So, stuff a few bags of Halfpops into your carry-on, overnight bag or back pack and enjoy a healthy, crunchy snack wherever you go! 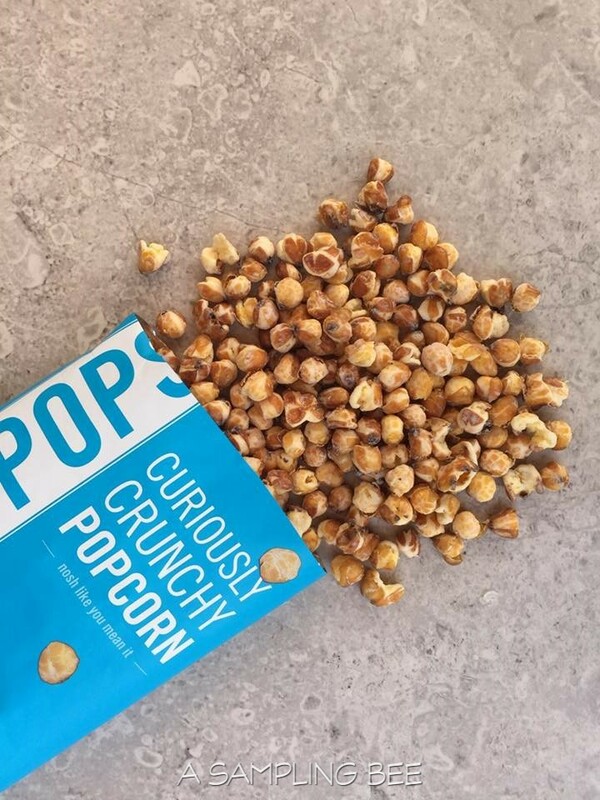 Halfpops are made with only the best ingredients and contain nothing artificial. 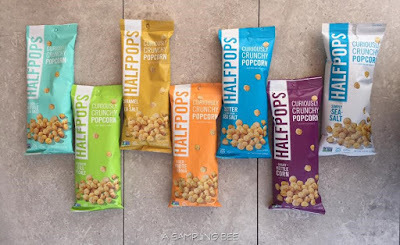 Halfpops are available in seven awesome flavors: Brooklyn Dill Pickle, Angry Kettle Corn, Aged White Cheddar, Simply Sea Salt, Caramel & Sea Salt, Butter & Sea Salt and Black Truffle & Sea Salt. These crunchy kernels are Non-GMO project verified, Certified Gluten-free and absolutely nut free! The half-popped kernels are never fried. As far as how they're made? Well, that information is under lock & key! Mike, the founder, popped tens of thousands of pounds of popcorn until he created that perfect crunch. Since 2011, his awesome popcorn creation has been flying off the shelves. Which made him realize that he wasn't the only one who enjoyed the half-popped kernels at the bottom of the bowl. 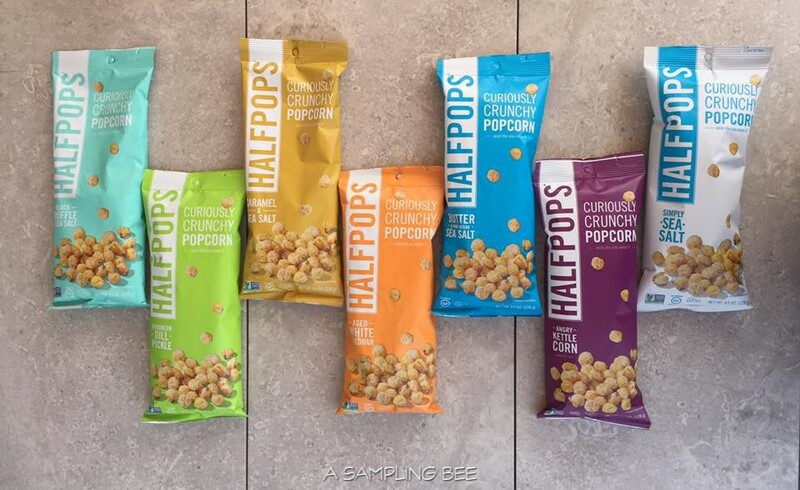 Now, Halfpops is available in 2,000 stores across the country! I received Halfpops in exchange for this review. All opinions are my own. Always! Visit https://www.halfpops.com/ for more information. Find Halfpops near you HERE. I've never heard of this snack before but I have to say I also enjoy those half-popped kernels at the bottom of a bowl of popcorn too. Having a whole bag of them in a yummy flavor sounds like a fantastic snack! That's awesome that the whole bag is popped no matter what. I love to find new snacks and popcorn is always a hit here. I'm so hungry right now and this would totally hit the spot! I'm going to check out where I can buy these. That looks so good! I love snacks like this especially since they come in different flavors! Perfect if you're looking for a crunchy and salty snack. Crunchu popcorn sounds nice! I would like to try this! gonna check this out on the market! I am pretty sure that my family would love these. A Creative and tasty snack! This sound amazing! I like that there are no crumbs! These would be perfect to toss in my purse for a busy day. They sound delicious! I dont think I've seen these anywhere before but they look delicious.. What a neat treat to enjoy. This is really sounds amazing and I really love this and perfect for our snack, Glad you share this ideas. HalfPops looks so yummy! I'd love to try out different flavors sometime. The fact that they're crumb free particularly interests me. I'm going to give these a try. They look like roasted chick peas which I love! I have not seen these in the store, or maybe I just wasn't paying attention. I would love to try them. Looks like a great snack plus of course, I get lots of dietary fiber by eating them. These look like really tasty snacks. I think I tried these before, I am just not sure. I love corn and this would n=be another delicious way to enjoy my favorite. Fresh Wave Father's Day Giveaway!